In a large bowl, combine corn meal, flour, sugar, baking powder, salt, and pepper. In a medium bowl, combine milk, eggs, green onions, herbs, and hot sauce, if desired. Stir into corn meal mixture. Let stand 5 minutes for batter to thicken slightly. Heat oil (about 4-inches/10 cm deep) to 350°F (180°C) in deep fryer, or in a deep saucepan. Drop spoonfuls of batter into hot oil, a few at a time. Cook 3-4 minutes, turning frequently, until floating and lightly golden. Repeat until all batter has been used up. Serve warm. To make ahead, prepare and store at room temperature for up to 1 hour, or in refrigerator if longer. Reheat in 350°F (180°C) oven for approximately 8-10 minutes, or until hot. 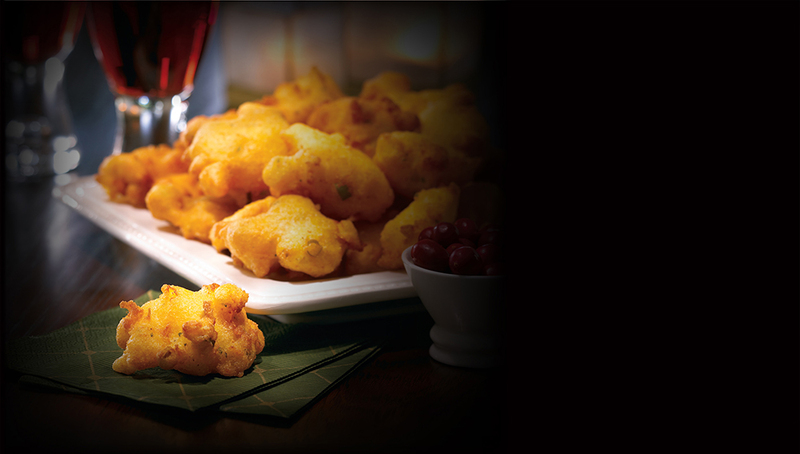 If desired, serve with caramelized onion chutney, or your favourite dipping sauce.